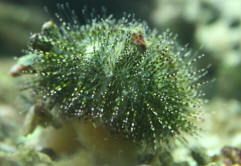 Related Articles: Sea Stars, Brittle Stars, Asterina Stars, An Introduction to the Echinoderms: The Sea Stars, Sea Urchins, Sea Cucumbers and More... By James W. Fatherree, M.Sc. 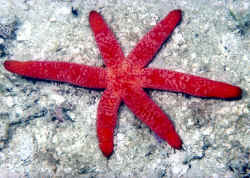 Fromia indica is one of a genus of "best" species starfishes for aquarium use. Chris K. here, happy to be in contact with you all and hoping I have an easy question/concern. 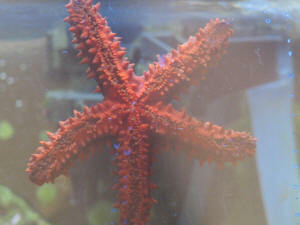 Recently I have been looking to add a few more sea stars my aquarium. Currently I have a run of the mill black brittle sea star. A free loader if you ask me, as he has planted himself in the lower grate of my overflow and simply hangs out there, arms extended, waiting for any extra scraps to be sucked his way. I know he isn't stuck because a few months ago he relocated to the overflow on the other side of my tank in the dead of night. I also have a sand sifting star Astropecten polycanthus, I have had him for a few years and truthfully usually forget I even have him because he spends visiting hours under the sand as expected. Recently I found another sand sifting star, blue and pink, Astropecten sp. Wanted to get him because I though I could possibly catch a glimpse of the colors once in a while as he sifts through the sand. My original research involved trying to find out if my 6 foot 125 gallon would support two sand sifting stars, considering that I do not keep hermit crabs, and have very few Nassarius and Astrea snails. I am not sure if those types of stars would even get along. However it was a complete shock to me to discover that they both like to eat bivalves!!! I have had a 3 inch blue maxima in my tank for many months with no issues at all. He and his friend my BTA are thriving under my new LEDs. Now my question, have I just been lucky, and should I move my sand sifter into my refugium? Would I be pressing my luck by adding the "prettier" pink and blue sand sifting star? I am hesitant after reading that true Nassarius snails will not harm clams, but sometimes LFS sell larger very similar snails as Nassarius, that will eat clams, hence I have not replaced the Nassarius snails that my conch killed. My conch incidentally was permanently banished to my refugium long ago for Nassarius murder and I know she would snack on my clam. I also wanted to add a few Fromia milleporella stars for color, they are beautiful and my tank is well established. Aside from the above mentioned stars, BTA and blue maxima clam, I have an indigo dotty back, blue cleaner wrasse and four false Percula clowns. It is also my hope to add one male and two female lyretail Anthias and a neon goby in the future. It is also my understanding that any thoughts of having an urchin are because of the clam. So, what is my best bet at adding starfish, I don't want to create a predatory environment. And if I need to remove the sand sifter star, what is safest thing to replace him with to keep my sand bed stirring? First off, thank you for all the help I have received previously through questions and the overwhelming amount of information on your website. You guys rock! :D Now, on to my latest question. My husband and I are planning our first saltwater tank. We already have many freshwater and two brackish setups. So, in light of our addiction, the next step is salt. We are in the researching stage and taking it extremely slow. 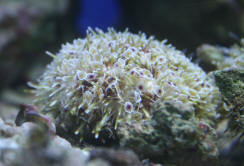 We have decided to get a Cinnamon Clownfish (Amphiprion melanopus) and a Bubbletip anemone (Entacmaea quadricolor). My question is, is there any starfish that is relatively hardy that could live with these two? so sorry for all the questions but I don't want my first foray into saltwater to crash and burn. I told my husband no anemone yet. We're also starting with a FOWLR system. Just to verify, we can have a cinnamon clown without an anemone? <These crabs if added in large numbers are great for algae control. and Chocolate Chip Starfish or Brittle Star. We have a 55 gallon tank to use for this setup. Obviously we can't have ALL these guys. I would like to know your recommendations and possibly some species we haven't thought about? We have a wonderful LFS that can order anything for us. <Best to search these species and others you may be interested in. Our site will provide you with the knowledge needed to properly care for them along with learning their needs, requirements, compatibility, and systems. If any questions remain unanswered, do write back. Here is a link to our marine index. Thanks to you for your awesome website. We searched for answers before writing you. We just purchased a General Starfish. but we double-checked the copper levels and they were at zero for a week before we got the starfish. The water is pristine as we were doing multiple water changes throughout the copper treatment. The starfish ate small pieces of shrimp the first two days, but we found it on its back two times and righted it each time. We thought it was dying but then it started to move around and explore the tank. During these first few days, it was getting harassed by the other fish...a couple of Chromis, a coral angel beauty and two damsels [and a needle-nosed hawk fish-who could care less about the starfish!] They were nipping at the starfish's legs and covering it with sand. Today is day 6 and it is upside down again, has its legs curled up under it like a ball, exposing its entire underbelly to the other fish. Its stomach[?] was out a little ways. We turned it right side up again and now it is curled up off the sand with all its legs over it, in a right-side-up ball, the underside of its legs are exposed. It looks like it is trying to get off the sand??? Could there be residual copper in the sand? We were told by our fish "experts" at the shop that the species is hardy. But now we are reading horror stories of deterioration and don't want this to happen. Should we return it to the store before it gets any worse? Thanks for your insight. We returned the poor animal on Saturday. At the shop, they seemed puzzled as to why it wasn't doing well. They are fully versed in our tank (condition, livestock, etc), and said that it should have done fine. I've learned my lesson, though. Research is so important, and I will be visiting your site from now on before making any purchase! Thank you for such an informative site. It's really amazing how little our LFS personnel know about marine life. when the LFS employee transferred it into it's transportation baggy. Thank you so much for your quick response. I was afraid that that was the case. Unfortunately, I don't get to chose future tank mates, they get brought home and I get stuck researching their bios. I am always reluctant on returning fish since it just causes them more stress. But I will make sure that a certain someone doesn't keep bringing home new fish w/o doing their own research first, (impulsive shopping at it's best). Is there anything at all I can try to feed it? Would buying a sponge to feed him be wise? Some sites/blogs have advised trying phytoplankton, but I really don't trust any other site than yours. You seem to be the only ones who know what you're talking about. Thanks again for your much appreciated help. Re: Starfish and Hydroids? Blue Linckia (Linckia laevigata) Better Left in the Sea. 2/9/07 <Hello again Travis!> Thanks for the great info, Mich! I'll avoid the blue Linckia star! <Very good!> Follow-up question: <Sure.> Would any/all starfish be damaged/irritated by crawling over rocks covered in hydroids? <Yes, it is possible.> i.e. If my rocks are mostly covered in hydroids, do I have to rid my tank of them before I could add any (non-sand-dwelling) starfish? <Mmm, no, but again not for the reasons you state. I am hesitant to recommend any starfish that are of the "rock scrubbing" type which I believe you are considering. Most just don't do well. Serpent and brittle stars should be fine. I wouldn't recommend the sand sifting star either, as it will take out much of the beneficial fauna in the sand bed and then starve. Hope that helps! -Mich> Travis.